Silver's Angels come to us after being alone, abandoned, or abused. They have many stories. Some are tales of terror, for it is not easy to make your way in the world without someone who cares to protect you. Not all of the animals that come through our doors are ready to be adopted. Many of them are suffering, their bodies broken, diseased or infested, their hearts and minds wondering why. For every happy ending, for every one we help by providing medical treatment, nourishment and love, there are others that are not adoptable and that will need sanctuary and a safe place to live out their lives. As a no-kill rescue and sanctuary, Silver Rescue is the only voice they have and the only kindness they know... other than yours. Please speak for them by making a donation to Silver's Angels. Help show them life is worth living, that existence doesn't have to mean only rejection and pain. Make a donation today, and be the one who cares. _A Good Samaritan first saw Boots flying across a driveway from the force of a basketball hurled at him by a neighbor trying to protect her own cat’s food from this hungry stray. When he landed, he lay warily under a bush, meowing ever so softly for help. She picked him up, took him home, and called him Boots. 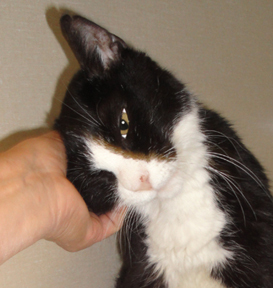 He purred and settled onto her lap and over time gained weight, grew stronger, and savored his safety. Then he stopped eating. His caretaker suspected depression and tried to entice him to eat. By the time she reached out to Silver Rescue, help, Boots was thinner and frailer than he had been when first rescued. a waiting game, watching for swelling in his neck or legs, which will indicate lymph node involvement. cat for whatever time he has left. each send a dollar, we can pay this expense in no time. Will you help us? 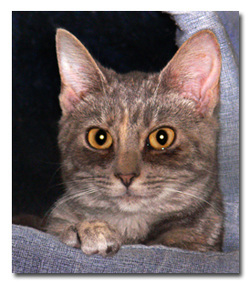 Kimmy and her siblings were born to a starved former house-cat who was abandoned, intact and not vaccinated. Mom tried her best to care for her babies but she was too weak to catch much food. Many people think that since cats are predators, they will be able to fend for themselves when forced to live outside on their own. House-cats, however, are accustomed to having their food set before them in a dish. They never learn or lose their ability to hunt. It takes experience, determination and getting very hungry before they succeed as hunters, and some never do. Neighborhood kids tormenting Mom with sticks and rocks brought her to the attention of a good Samaritan. Thank goodness the children didn’t discover the kittens! Understandably skittish, Mom needed a little coaxing to allow the good Samaritan to take her little family home. There, despite efforts at bottle feeding, the sickly kittens died one by one. Kimmy alone was strong and feisty enough to survive. But there was a price for the poor beginning. Both mother and daughter suffered recurring upper respiratory infections (URIs). In normal cats, a small hole called a puncta is present in both the upper and lower eyelids very close to the where the lids meet near the nose. Tears normally flow down these drainage holes into a central collecting sac that sits just under the skin below the eye. From this sac, a small tube or duct carries the tears into the nose, helping to keep the nose and nostrils moist. Baby Kimmy’s multiple URIs caused severe scar tissue in her nasal passages, so although her tear ducts continued to produce tears normally, Kimmy’s tears overflowed onto her cheeks, causing a perpetually wet little face. A number of attempts – some requiring anesthesia – have failed to solve Kimmy’s problem. The specialist recommends a trip to the University of Tennessee in Knoxville for a solution that will allow her to live normally and eventually find a forever home. For now, she is not adoptable with her sickly-looking face, uncomfortably damp facial fur, and flying moisture whenever she shakes her head. The operation will cost $1,200 - $2,000, depending on the extent of the blockage. That may sound like a lot of money for one little cat. But isn’t that what rescue is all about – finding a way to help a pretty, playful, otherwise-healthy young animal recover from a poor beginning and have a chance at a normal life and a loving home? Can you help us pay for Kimmy’s surgery? The rescue is full and my pockets are empty. I can’t afford to take her in, but I know I can’t afford not to. I remember the day my neighbors brought her home. I watched them show their toddler the cute little puppy, petting and cooing over her. I hoped they would make her a part of the family but a couple of months later I can hear her constant cries. She is tied out alone in the dark back yard. There is another dog tied out back there already. They say he is aggressive, so they tether her out of his reach, with no one to snuggle with for warmth. Now she is a young adult and today she has finally slipped her collar and escaped from the chain that has imprisoned her 24/7. She nervously darts around the neighborhood, back and forth across the street, dodging cars. She looks terrible with ribs showing, and oh my, those reddened, bulging eyes. Clearly, her advanced cherry eye (http://mia-carter.suite101.com/cherry-eye-in-the-dog-a55672 ) has been neglected for some time. I call her to me and she inhales the bowl of food I offer. Her owner returns home. He puts on boots and thick leather gloves and walks over to get her. Does he think she will bite? I have been petting and testing her for aggression for over an hour. She has tolerated each pinch, pull and tug as sweet as can be. He tells me he can’t afford to have her spayed and vaccinated or to relieve the eye condition that threatens her with infection and permanent corneal damage. As we talk, I know he will do nothing to help her. If I let him take her home again, she will spend the rest of her life on that chain, getting pregnant again and again, with no love or medical care and very little food. I make my decision. He agrees to surrender her to Silver Rescue. I don’t know how, but I’ll find a way to pay for all she needs to get well and find a loving forever home. So here I am, asking you again for money. Her spay, vaccinations, deworming, heartworm testing and eye surgery cost $325. That’s a lot and times are hard, but if 325 people donated just $1, we can pay off her vet bill in no time. On behalf of Turtle, thank you! Babe lay by the side of the road shivering from pain, fright and starvation. Babe is a little American Staffordshire Terrier boy who, like so many of his breed, hasn't been treated all too kindly. He looked so tiny, with his bent legs and thinness. Like a 6 month instead of the 8 month old he seems to be. Babe got very lucky the day a kind lady found him. A little longer and he would not be alive. He was in bad shape. One leg was twisted and the other had an open would and slash up its side, and the outside toe was hanging strangely. What ordeal this boy went through we’ll never know. The kind lady could not afford to help this puppy beyond bringing him home and giving him love. No one could help. All rescues were full. By the time she found us, 3 days had past. Not good for his little bones. 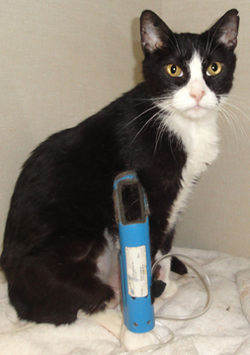 Once at the vet, it was determined that the injuries where several days older than that even; perhaps as old as a week. So, this boy had drug himself around for several days already, in horrible pain, starving and afraid. By now the bones were growing back together, crooked. Young dog's broken bones grow back together fast, crooked or not. But Babe was lucky in that they grew back fairly straight. Because of that we opted not to re-brake the leg. However, the knee cap was twisted and dislocated which caused Babe to twist the leg into an odd position, not allowing him to stand. Left untreated, it would leave him permanently crippled. On the other leg, the odd wound and partially healed slash up his leg seemed foul play rather than a hit and run. The vet could not say for sure, of course. The toe on that side had been broken and was detached from his foot, hanging infected inside the skin. Surgery repaired and re-aligned the knee cap and the leg; the broken toe was amputated and the wound on that foot cleaned and sewed together. Babe went home with pain pills and antibiotics and is healing well with tender loving care. An odd wound on his lower lip is also healing well. And here is were I have to ask you for help. Because Babe’s Good Samaritan did not have the money Babe needed, she turned to us for help. We had her take the boy to Animal House Veterinary Clinic where rescues get discounted rates. But even so, Babe’s bill came to $506.22. Can you help us pay Babe’s bill? We know times are hard right now, but with these hard economic pressures the abuse to pets has much increased, and money to help them is short or none existent to rescues. If you could help us with just a few dollars, we would much appreciate it. Every donation, no matter how small will go a long way to pay Babe’s bill. Please mention Babe and Silver Rescue for your donation. Leave your name and address with them to receive a tax deductible receipt. Thank you very much! 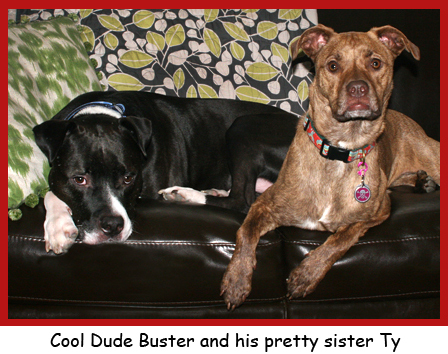 Update: For your help with Buster's medical needs, we thank you! All his bills have been paid. Buster has been adopted into his perfect forever family! When Buster came to us 3 yrs ago, he was limping and the pad of his paw was a bloody, raw mess and the rest of his leg atrophied and mostly unusable. We thought he might have been a hit and run victim leaving him with a broken and badly mended leg. However, X-rays revealed a much more sinister diagnoses. He was born deformed. Calcium deficiency. He was, almost assuredly, a product of backyard breeding. You know the story. Mother dogs are used as breeding machines to produce one litter after another without benefit of proper vetting, vitamins or food. Their bodies depleted, they are unable to make healthy babies. For the most part, we've been able to keep Buster in good repair, but recently he re-injured his paw. This time it was different. Normally stoic, he could not hide his pain this time. His paw refused to heal and he began chewing into the open wound, widening and deepening it up to the bone. It was like he was methodically removing the source pain even if it meant chewing off the paw. I have seen my share of open wounds. I have worked as a surgical photographer seeing the raw insides of human beings. I have never been bothered by this. But when I saw what Buster was doing, it brought me to my knees. Clearly, we were out of choices. It was time to operate. Buster's leg had to be removed. We hoped we would never have to face this. After all, even with a limp the leg was a source of support to his big bully body. Amputation would be hard on him but being still a young and otherwise strong dog, he had a better chance to overcome this trauma now than if he had been older. His good temperament and happy go lucky outlook on life would help see him through it. We were told that many non-bully dogs do not survive such a surgery by more than a few months, the trauma being too great to overcome. The success rate for pit bull dogs, however, was high due to their inherent tolerance for pain. Certainly, Buster had a great tolerance for pain. Regardless of the outcome, we had no choice. His only chance now at a decent life was amputation. Because of the emergency of his injury, Buster could not wait for us to raise the money for his surgery. Our veterinarian is graciously working with us, allowing us to make payments as we can. So far his bill is $670 for the amputation but Buster has an immune deficiency which causes him to heal slower than he should. To avoid infection and to insure proper healing, he will have to stay at the clinic for a while longer. Boarding costs and medications to see him through it will likely cap the total bill at around $1000 all in all. We have received and paid a $200 donation already. Please mention Buster for your donation. Thank you very much!